Welcome to the first installment of Docket Alarm’s Know Your PTAB Judge newsletter. Each month, we will be featuring a profile on a different PTAB judge. This month, we are proud to feature Judge Justin T. Arbes for our kick-off edition. Judge Arbes is a graduate of the University of Illinois College of Law. Prior to law school, he worked as a software developer for several organizations, including the FBI, after graduating with a Computer Science degree from Michigan State University. After finishing law school, he clerked for the Honorable Avern Cohn for the United States District Court Eastern District of Michigan. Prior to joining the bench, Judge Arbes was in private practice at several firms, including Hunton &Williams and Arnold & Porter. The Honorable Justin T. Arbes was sworn in to the Patent Trial and Appeal Board on March 1, 2012. His tenure has been an active one, issuing 28 final written decisions— canceling all instituted claims in 17 petitions, canceling some claims in eight petitions, and refusing to cancel any instituted claim in three petitions. Notable rulings include a suite of casesinvolving the well-known patent aggregator Intellectual Ventures Management and tech company Xilinx, Inc. Intellectual Ventures filed several petitions for Inter Partes Review (IPR) against patents owned by Xilinx. Judge Arbes, along with Judges Karl Easthom and Sally Medley, issued decisions in favor of IV’s petitions, cancelling all challenged claims in four different patents on obviousness and anticipation. Judge Arbes authored opinions for two of the four IPRs (IPR2012-00018, IPR2012-00019, IPR2012-00020 and IPR2012-00023). The Judge also issued final written decisions in two IPRs (IPR2013-00080 and IPR2013-00081) involving computer giant, Apple against Achates Reference Publishing, Inc. Achates alleged that Apple used its partnership with developer QuickOffice, Inc. to circumvent the one year statutory time limit for filing an IPR. Judge Arbes opined that an indemnity clause in Apple’s developer agreement with QuickOffice did not create legal privity between the two companies, and that Apple’s petition for IPR was not time-barred under 35 U.S.C. § 315(b). IPR2013-00081, No. 80 Final Written Decision at 9. The court went on to cancel all of the challenged claims described in each petition on the grounds of obviousness. Further insight can be gained by viewing Judge Arbes’ record on Docket Alarm’s statistics platform. 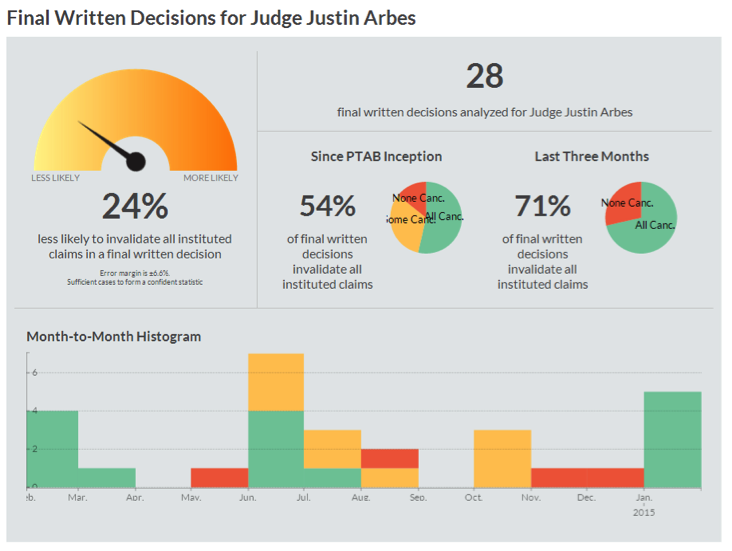 Users can view statistics on how many petitions Judge Arbes is hearing per month, how many petitions he has instituted, final written decisions he has issued, parties and firms that have appeared before him, and much more. For example, based on an analysis of his 28 final written decisions, Judge Arbes is 24% less likely to invalidate all instituted claims than his fellow administrative patent judges. However, in the past three months, he has invalidated all claims in 71% of final written decisions issued, which is more in line with the norm. Lawyers representing both petitioners and patent owners can use this information to determine what direction their litigation strategies need to take, such as whether or not to file a petition and what claims to contest if appearing before Judge Arbes. - Search all documents filed in all of Judge Arbes’ cases at the PTAB. - View Judge Arbes’ judicial profile, with statistics on petition grant rates and other data, click here.